With a glut of monster stories available on the picture book market, I’m always on the lookout for a monster story with some ‘pop’. Happily for me, Noll has come up with an innovative twist for I Need My Monster. The story is about a little boy, Ethan, who is missing his usual under-the-bed monster, Gabe. Sadly for Ethan, Gabe has decided to go fishing for the week! Several monsters arrive one-by-one to see if they can fill Gabe's shoes, but these are monstrously big shoes to fill. The boy simply must have a monster with the traits to which he is accustomed; a long tail, ooze, claws and all those other attributes which make Gabe the perfect monster for Ethan. This story is a pleasure to read, and I am a firm believer in pleasure reading, especially for little people. Also, I need to mention McWilliam's illustrations. According to his bio, this is his first picture book and I am in awe! The pictures are vivid and gorgeous. They're the sort of 'eerie' that allow kids to enjoy being just a touch afraid; read, hide under the covers and then take another peek. 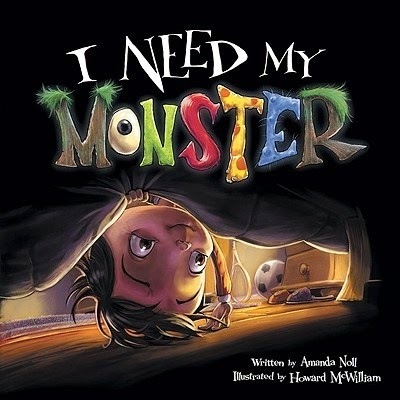 I Need My Monster is good fun and great for stimulating the budding imagination.